We’d love your help. 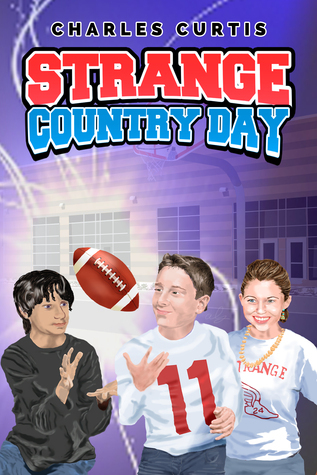 Let us know what’s wrong with this preview of Strange Country Day by Charles Curtis. To ask other readers questions about Strange Country Day, please sign up. Alexander is starting a new school and seventh grade, and right from the first day, things don't run as he expects. A lot is going on the first chapters of this book: Alexander experiencing mob bullying, strange 'powers' appearing, meeting girls, inventor Dad with strange inventions and being sucked onto a football team. I felt a bit muddled at first, as if trying to search for the main string among an avalanche, but once the story got rolling, things started clicking into place. Alex is an inter Alexander is starting a new school and seventh grade, and right from the first day, things don't run as he expects. A lot is going on the first chapters of this book: Alexander experiencing mob bullying, strange 'powers' appearing, meeting girls, inventor Dad with strange inventions and being sucked onto a football team. I felt a bit muddled at first, as if trying to search for the main string among an avalanche, but once the story got rolling, things started clicking into place. Alex is an interesting kid who simply tries to get through situations as best (and as painless) as possible. He doesn't do anything to start his sticky situation, but is rather thrown into the mystery unexpectedly. He's level headed, has a good heart, and sees things as a seventh grader should. I believe kids will have no trouble relating to him...and especially boys will love the football twist. There are several messages in this book--bullying and friendship standing center stage. It was fun to watch the friendships develop and hold through even difficult situations. I enjoyed the way Alex and his friends dealt with things, and saw a lot of truth in the way the older students or even coaches sometimes reacted. There are many things seventh graders will recognize and sympathize with. And it is no trouble to route for Alex the entire time. The story itself moves along nicely. One has to be a little open-minded when going into it, but kids will have no trouble accepting things with their fantasy. I mean, what young football fan doesn't want a perfect robot coach of their very own or to discover they can do amazing things? Summed up, this is an enjoyable read and I think kids (especially boys) ages 8+ will enjoy Alex and his strange adventure.